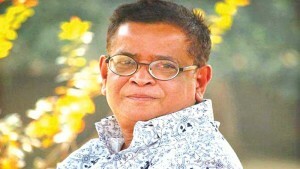 Humayun Ahmed is a popular Bengali writer of fiction and drama. He had a “meteoric rise in Bangla literature” since the publication of his first novel, Nondito Noroke. Being a prolific writer, he has been publishing since the early 1970s. He was formerly a professor of Department of Chemistry at the University of Dhaka, Bangladesh. But now he is a full-time author and movie-maker. 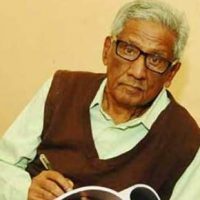 Immediately following the publication of his debut novel, Ahmed emerged as one of the most prominent novelist and story-writer of Bangladeshi Bengali literature. Humayun Ahmed’s books have been bestsellers. He has also achieved success as a screenwriter for television since the late 1980s. In the early 1990s, he entered the movie-world and proved to be a successful filmmaker in spite of clear departure from the trend of traditional Bangladeshi movies. Humayun Ahmed was born to Foyzur Rahman (a high-ranked police officer and writer, who gained martyrdom in the liberation war of Bangladesh) and Ayesha Foyez on 13 November 1948 in Kutubpur of Mymensingh district in then East Pakistan, now Bangladesh. Humayun Ahmed’s younger brother Muhammed Zafar Iqbal, a university professor, is also a famous writer, newspaper columnist who attained fame for writing science fictions and youngster novels. Another brother, Ahsan Habib (cartoonist), is the editor of the only cartoon magazine of Bangladesh, Unmad. Humayun Ahmed was married to Gultekin, granddaughter of Principal Ibrahim Khan, in 1973. They divorced in 2003. Later Ahmed married Meher Afroz Shaon. Humayun Ahmed often shows a fascination for creating stories around supernatural events; his style is characterized as magic realism. Humayun Ahmed attended the Chittagong Collegiate School, Comilla Zilla School (some time) and Bogra Zilla School. He passed intermediate from the Dhaka College. After graduating from the University of Dhaka, Ahmed joined the Department of Chemistry in the same university as a lecturer. He obtained his PhD in polymer chemistry from North Dakota State University under the guidance of Professor Joseph Edward Glass. Ahmed retired from the University of Dhaka for the sake of writing and film-making. Humayun Ahmed had a meteoric rise in Bangla literature. His first novel, Nondito Noroke was written while he was still a student of the University of Dhaka, gained immediate popularity and critical acclaim. Equally successful was his second novel, Shankhanil Karagar (tr: “The Conch-blue Prison”), later made into a successful film by Nasiruddin Yusuf. 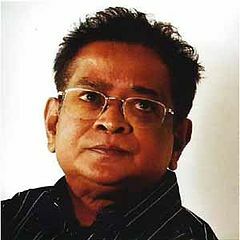 Humayun Ahmed went on to become one of the most prolific writers in Bengali literature, having published around one hundred and fifty novels to date. 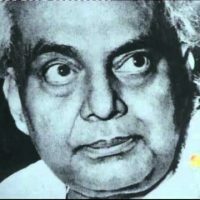 Along with his more traditional novels and short stories, Ahmed is often credited with creating or maturing many literary genres in Bangladesh. The rise of Bengali science fiction can largely be attributed to Humayun Ahmed and his younger brother Iqbal. His televised drama Bohubrihi was one of the most successful productions of the national TV of the country called Bangladesh Television. He later developed Bohubrihi into a novel. Though set in the realities of middle class life, Ahmed’s works display a particular penchant for the mysterious and unexplained. He himself and his literature are often referred to as “moon-struck,” and references to the full moon in his prose are numerous. In almost every one of Ahmed’s novels, there is at least one character who possesses an extraordinary milk of kindness—a characteristic of Ahmed’s writing. Also, he is prone to create funny characters through which he reveals social realities and passes on his message. 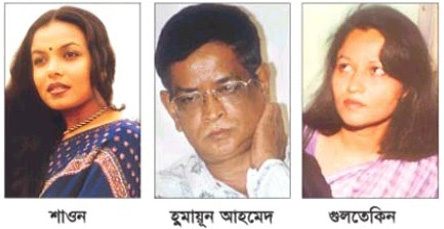 Humayun Ahmed produced three books which were published by Sheba Prokashoni. A teacher of Dhaka University, he was in financial hardship when he heard that Qazi Anwar Hussain pays immediately for works of translation to be published from Sheba. He was given a book titled Man on Fire which he translated in seven days and Qazi Anwar Hussain gave him 300 Taka as soon as he appeared with the manuscript. It was published under the title “Omanush”. He translated two more books for Sheba, Samrat and The Exorcist.